Horo is a 600-year old sage whose true form is a huge dire wolf. Long ago, she made a promise to make bountiful the wheat harvest of a small village. The villagers worship her as a deity, meaning they get pissed off at her at the occasional drop in the harvest. In time, the humans learned agriculture techniques that let them control the harvest themselves, making them shun their 'deity of harvest' as a superstitious tradition. Horo was sad how things turned out this way and chose to move on, traveling with male lead Craft Lawrence (a passing-by merchant) and heading towards her homeland up North. The centuries put good wisdom in her head and her senses are animal-sharp (this includes indulging in food). Horo helps Lawrence increase his profits beyond the increased costs he has from being around her. To strangers, she will weave a cryptic form of speech, made eerie as she always has her head covered (to hide her wolf ears). To Lawrence, most of the time she's having an insightful or educational conversation with him or is teasing him for which he retaliates. She has a melancholy side though, due to 600 years of memories, some of which are not always pleasant. 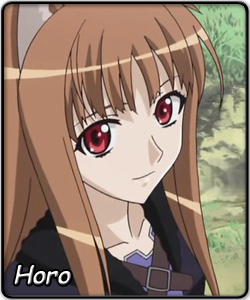 Virtual unknown Horo was set to debut in the 2008 Saimoe Circuit beginning with the Anime Saimoe Tournament of Japan. However, upon hearing that an International League was merely beginning, she entered the preliminary nominations, where she made a surprising effort to reach as high as first place before eventually settling for 3rd, which puts her safely in this tournament. With a head-start on the 2008 competition, Horo will be able to compete against just about 50 of the best Saimoe participants in this league, including Rika Furude (Higurashi no Naku Koro Ni), Hinagiku Katsura (Hayate no Gotoku), and Shana (Shakugan no Shana). As the virtual unknown contender in this league, Horo could possibly make a surprising and astonishing debut, which could lead her to winning the first International Saimoe tiara.